1.1 What Makes CleaRx Different? 1.2 Should you use a tonic? 1.3 Choosing the right tonic for skin with acne? 1.4.1 Do You Like This Article? Acne causes embarrassment and discouragement for millions of people. Most are in their teen years, but adults are affected, too. There are many choices of acne treatment on the market. Some are well formulated, while others are weak and ineffective. Finding the best acne treatment for your skin can improve your outlook. Learn more about acne in my other article “Acne | Home Remedies And Treatment”. Find out 9 easy steps to clear skin. Gentle but thorough cleansing with fingertips or exceptionally soft washcloth (hard materials are strictly prohibited). Clean the face well, including the chin line, neck and behind and in front of the ears. Use the right cosmetic that is optimal for your skin. If you have acne slightly expressed, it is possible to treat it without prescription drugs. If you must take drugs, give preference to drugs containing salicylic acid or benzoyl peroxide. If you use prescription medications for the treatment of acne, you should use a gentle, non-drug cleanser. According to MOM CURLS “The 18 Best Face Washes & Cleansers for Sensitive Skin 2018”, these top four cleansers are the best. If makeup on your face or your skin is too dirty during the day (sports games, training can be the reason), it is advisable to double-clean before going to bed: apply cleanser, rinse, and then repeat all over again. Just remember that you should not use antibacterial soap, it will only harm the skin with acne because instead of cleansing, you will get irritation. These cosmetic preparations allow you to eliminate excess fat, and some even include active ingredients against acne. Apply the toner to a cotton ball or disc, then gently slide it over your face and neck to remove any makeup, cleanser or grease residue. If your skin is irritated due to the treatment of acne or it appeared opened pimples, the best choice will be the means without alcohol. Otherwise, these toners can cause a burning sensation. According to Cosmopolitan.com, these are the best toners and they won’t let you down. If toner or astringent excessively dry or irritate the skin-stop using them. The same rule should be followed in respect of prescription drugs for acne-they also have a drying effect on the skin. According to Clear Away Acne website, these are one of the best astringents on the market. After the toner is completely dry, apply anti-acne products to the skin. It can be as special medicines and gels, creams, available without a prescription. Before proceeding to the next step, allow the drug to fully absorb and dry. If you can not find the right product yourself, consult your dermatologist or beautician. Apply a moisturizer or gel that does not contain oil, you can not skip such an important step. Most acne medications dry the skin heavily. To reduce dryness and flaking, it is necessary to apply a light moisturizer twice a day. Moisturizing gels and lotions are usually lighter than creams. In any case, it is necessary to choose a gel that does not cause acne and does not contain oil. Dream of perfect skin – take care of it every day! I want to introduce to you new breakthrough in acne treatment called ClearRx. 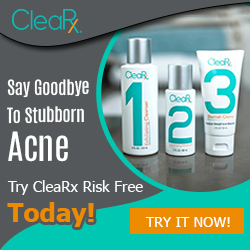 Say Goodbye To Stubborn Acne Try CleaRx Risk-Free Today! Should you use a tonic? As for many other questions about the care of problem skin, there is no single correct answer. The decision to use the tonic depends on many factors: personal preferences, skin characteristics, the type of cosmetics you are already using. There is a stereotype that tonics are necessary in order to close the pores. However, this opinion is wrong, the pores of the skin cannot be” open “or”close”. Therefore, tonic-a tool that is not necessary for quality skin care. In the care of very oily skin tonics and astringents can prevent discomfort caused by the active release of sebum. In addition, these tools reduce the shine that appears during the day, so that your makeup will last longer. But, if you have hypersensitive skin or you use drying agents for the treatment of acne, then it is advisable to refuse tonics. Many of them contain alcohol or other ingredients that dry the skin. Additional use of such a drug will only exacerbate the dryness of the skin, which will be unusually high due to the effects of drugs such as Retin-A, Benzacline, and other topical antibiotics. In some cases, tonic may worsen the condition of acne. If the skin is affected by inflamed, cystic rashes, the application of this tool can cause a burning sensation or acute pain. If you like how your face becomes after applying the tonic, you can safely continue to use it. But still, you have to understand that the refusal of this type of cosmetics will not harm your skin. Choosing the right tonic for skin with acne? Pay attention to the active ingredients in the product. Do you need a remedy for minor skin defects? Then cosmetic products containing salicylic acid is the best choice. Glycolic acid is also a good alternative. If possible, consult a dermatologist about which cosmetics are best for your skin. Skincare is an art, but it is not necessary to go into it at great sacrifice. Take care – apply cosmetics correctly! The best products for treating your acne are natural, gentle products. Look for botanical ingredients in the list. Some herbal ingredients that are healing to blemished skin include sage, yarrow, coltsfoot, wild thyme, horsetail, Althea (or marshmallow), and balm mint (or Melissa). Aloe vera is a well-known skin healer and is often included in good acne products. Also valuable in a treatment remedy for acne are certain essential oils. Some essential oils are harsh for the skin. (None should be used straight, but should always be diluted with a carrier oil!) The best acne treatment products might include oils such as lavender, rose, tangerine, and geranium. These are not only healing to the skin but will make the product smell great, too. If the product is made with a transdermal system, any vitamins or herbal ingredients will be able to absorb into the skin and treat the acne where it starts. Some vitamins that might be included in a topical acne treatment include vitamin C, vitamin A, vitamin E, and pro-vitamin B5. A moisturizer is also an important part of acne treatment. Like other components, it needs to be 100% natural, or it can make matters worse by contributing to clogging the pores. Make sure you take the time to read the label to make sure the ingredients are natural botanicals, nutrients, and healthful oils. Some people say you should try to use only products on your skin that you would be willing to put in your mouth. This might not always be the case since the skin does act like a filter while absorbing nutrients and other substances. Still, one should be cautious about using unnatural products. If you have a story to share or you had a battle with acne and would like to share details and help other people, you are welcome to leave your comments down below. Finding the best acne treatment for your skin can improve your outlook. Dream of perfect skin – Learn how to take care of it every day!